Posts appear below are in order of the most recent writings. 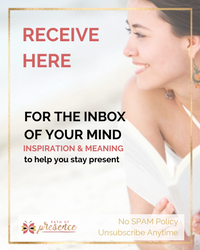 Click here for more INSPIRATION to supplement your mindfulness & gratitude journey. If anyone knows me and my sweet family, they'll know that we are upwardly mobile. Every couple of years, we are on an adventure, and we live in a new state (body, mind, and spirit), allowing us to renew what we need and release what we do not. Our philosophy that life is to be lived, embraced and experienced has given us the courage to relocate where we want, anywhere in the world. This privileged lifestyle has paved way for us to meet amazing people everywhere we have resided, and we love it. This gives way to clear out not simply the physical items, but also the emotional baggage that may have collected. One of the most amazing gifts about moving often is the opportunity to clear out what we no longer need. Intentionally releasing the item(s) frees the energy to travel back from wherever it came. This list is part of our moving list now, and I'm sharing it in case anyone wants to join us in surrendering that which no longer serves ... Aho!